A guide on how to meet the WHO sugar guidelines to limit added sugar to six teaspoons a day. The World Health Organisation (WHO) recently advised us that six teaspoons of added sugar a day is ENOUGH - not to aim for six teaspoons a day for good health, but for good health to limit your intake to this. Six teaspoons is equivalent to approximately 24g of sugar. So what exactly does this mean in practical terms? Lets take a look. 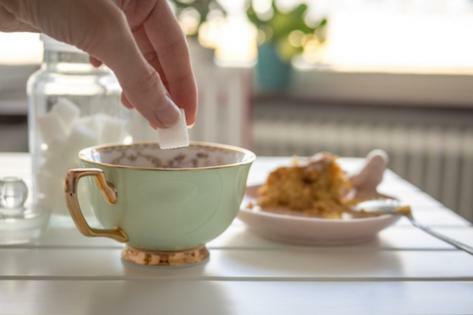 Added sugar doesn’t just refer to sucrose, which is the ‘table sugar’ (whether white, brown, low GI or raw) that gets spooned into tea or sprinkled on your oats. It refers to the multitude of added sugars in today’s food supply. This would include everyone’s favourites agave syrup, brown rice malt syrup and honey. Also: maple syrup, treacle, molasses, fruit juice concentrate, caramel, corn syrup, malt syrup, fructose, dextrose, maltose, glucose – in fact, anything that ends in ‘ose'. Ahhh … it’s tiring just listing them all! I sure that I’ve forgotten some. How much sugar is in a teaspoon? The added sugars above, whether in a granulated, powder or syrup form have pretty much the same amount of sugar – that being about 4g in a teaspoon . First and foremost, when we are talking about limiting added sugars this does not include the natural sugars found in milk, yoghurt, fruit and some vegetables. All of these foods are nourishing. They bring an abundant of nutrients and health properties to the party, and absolutely should not be avoided – NO, not any. Not at all! Sugars found naturally in these foods include fructose, lactose and sucrose (yes sucrose can be found naturally too). The nutritional information panel on a food label doesn’t differentiate between natural sugars and added sugars, making it really confusing! All of the sugars in a food just get clumped together under the ‘sugar’ banner. For example, a high fibre, nourishing breakfast cereal may have a small amount of sucrose added for palatability and have some dried fruit such as sultanas and apricots in the mix. The amount of sugar from the sucrose AND the dried fruit will show up under the one sugar heading on the label. This is where food knowledge can come in handy, to help you make a more informed choice. Before heading straight to a food label, I like to encourage people to take a look at the food (the FOOD - not the isolated nutrients). Using the cereal example, if you can see plenty of nuts, seeds, oats and some dried fruit it’s a good sign that it’s a nourishing food that will probably keep you full and satisfied after eating. On the other hand, if the cereal has different shapes and colours that you generally don’t see in nature, you can guess that it’s heavily processed and probably has the added sugar and salt to match. If you do want to decipher the label to find out how much added sugar you may be eating, here is a bit of information on the amount of natural sugar in food to put things into perspective. 1 small sweet potato (weighing 400g) has about 20g of natural sugar. You could use this information to figure out how much added sugar may be in your favourite yoghurt or breakfast cereal. Using the yoghurt example below, this 150g tub of yoghurt has 18g of sugar. About 7.5g of that would be the natural sugar lactose (because we know that 200g of natural yoghurt has about 10g of sugar from the information above). Therefore, about 10g of the sugar would be added. There would be a tiny amount from the strawberries but not a whole lot – notice that it is listed almost last on the ingredients list. This means that there is approximately 2.5 teaspoons of added sugar in this tub of yoghurt. OMG … way too much math to use everyday, but an interesting exercise none the less! On the other hand, if you have a food product or beverage that obviously does not have any nourishing natural sugars, you can pretty well assume that the majority of the sugar outlined on the label is ADDED. For example, 200ml of Coke has 21g of sugar. You don’t have to have good food knowledge to know that this is all added and will bank you a little over five teaspoons of added sugar for the day. Fructose is found naturally in various foods including fruit, vegetables and table sugar. There is a myth that the liver turns all fructose consumed into fat. This is untrue. A person who is eating enough kilojoules (energy) that they require will convert a small amount of fructose (about 1-3%) into fat, which has minimal effects on health. The rest of the fructose consumed is converted to glucose for the muscles, brain and central nervous system to be used as energy. It is only if a person overeats that excess fructose is converted to fat in the form of triglycerides. But the underlying problem here is not fructose it is overeating. In addition, labeling fructose as toxic or fattening makes people cut fruit out of their eating patterns. Fruit is a nutrients dense, low energy snack that is important for everyone’s health and wellbeing. Everyone should have two serves of fruit a day. The WHO guidelines suggest six teaspoons a day as the upper limit. This shows that it doesn’t have to be avoided at all cost, nor does it harm you in small amounts. I respect that some people still choose to avoid having any added sugar. However, if you have a diet based on whole, minimally processed foods, a small amount of sugar added here and there to nourishing foods will do no harm. I love my 3pm snack of berries, seeds and some natural yoghurt with a small drizzle of honey – and I will continue to enjoy this. Also, enjoying your favourite chocolate or dessert in moderation will be totally fine (FYI four squares of Cadbury Dairy Milk chocolate has 14g of sugar with some - just some - being the natural sugar lactose).